We made it to one of the wonders of the world! 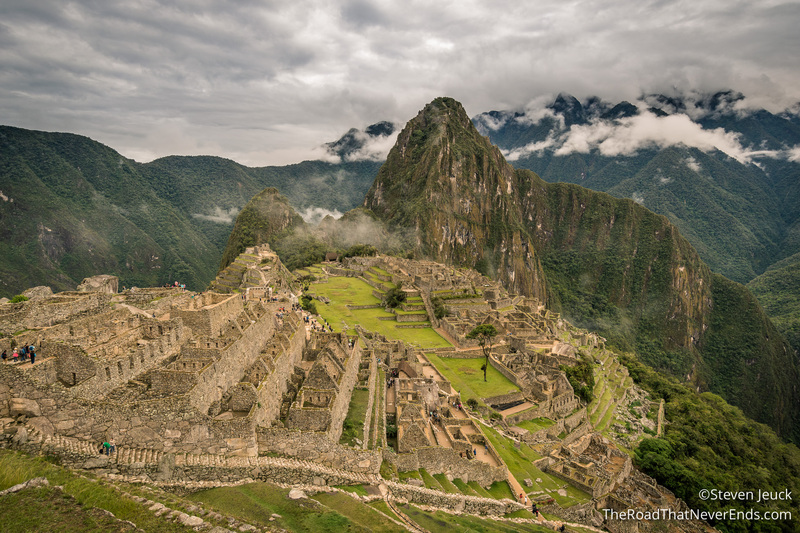 Machu Picchu was built in 1450, but abandoned a century later during the time of the Spanish conquest. It wasn’t found again until the early 1900’s. 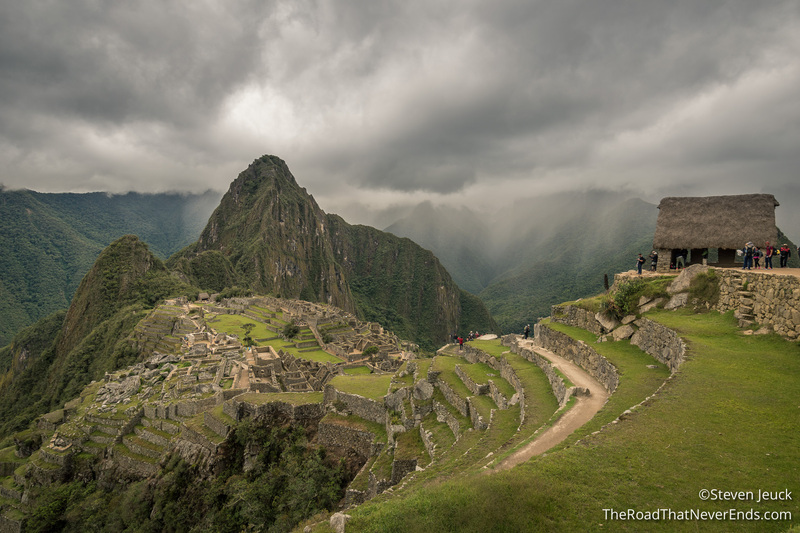 Machu Picchu is often called a city in the mountains, and it really is. The ruins lay on top of a mountain at 2,430 meters (7,900 feet) above sea level. 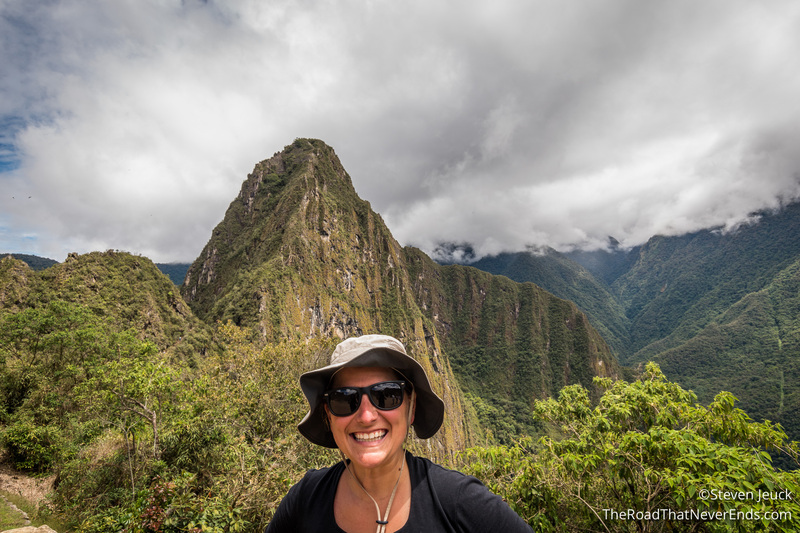 There are two ways of getting to Machu Picchu – (1) Complete the 3-night/4-day trek with a tour group or (2) Take a train into Aguas Caliente, the city base for Machu Picchu. We chose the train option for a few reasons: it is cheaper than a trek tour, and after our not so great altitude experience in Quito, we weren’t sure if we can make the trek (and enjoy it). Although we are a bit bummed we didn’t do the trek, we believe we made the right choice for us. We bought our tickets ahead of time (as recommended) because they only allow 2,500 people in to the ruins per day. 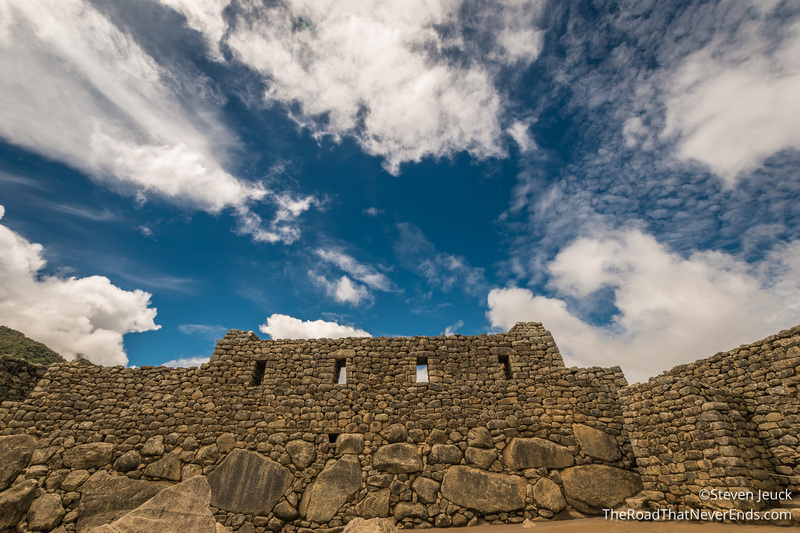 In addition to admission into the ruins ($50.00), there are a few add on features: (1) Museum entrance for $9.00, (2) Hike up Huayna Picchu for $10.00, and (3) Hike up Machu Picchu Mountain for $6.00. We decided on option 2 for a total ticket price of $60.00. We stayed at Hostel La Playacha, and it was literally on the train tracks. The town is extremely small, and most hotels are within a quarter mile of the train station. We thought this would be annoying, but the last train was around 10PM and the first train we heard was 6:30AM, and we were already awake and headed to the bus station. We booked our room a week prior to our stay, but after staying there we learned that you can show up in person and negotiate a better rate (at least in the off season). We may attempt this in a future city. 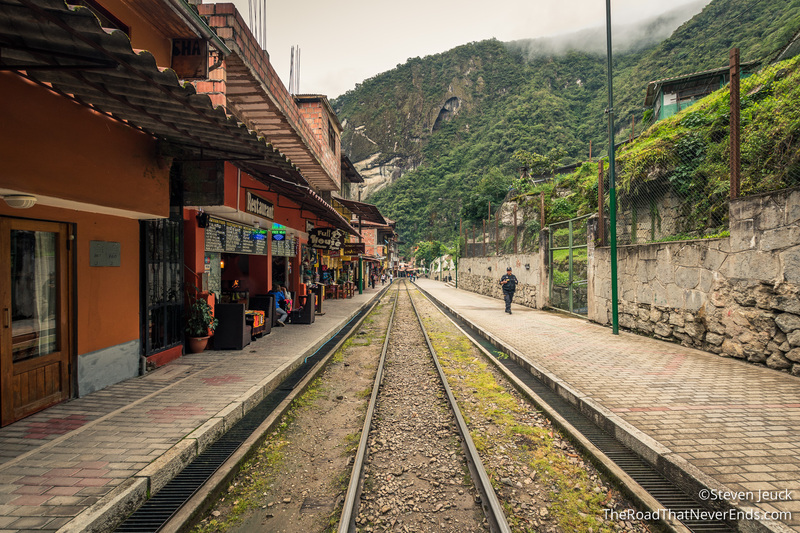 We booked a train ticket from Ollantaytambo to Aguas Calientes on PeruRail. The price was $62.00 each. Arriving at Aguas Calientes, we had two choices: (1) walk to Machu Picchu ruins, an hour hike uphill, or (2) buy bus tickets that take you directly to the ruins. We chose the bus option, as we wanted to save most of our energy for hiking in and around Machu Picchu. The bus ticket around trip costs $24 USD per person, and the earliest bus leaves at 5:30AM. The busses leave pretty regularly, and we had no trouble catching a bus to and from Machu Picchu. In Aguas Calientes there are other tourist attractions besides Machu Picchu, such as the hot springs (get it – Hot Waters??) and a main square. Unfortunately, we didn’t go to any of them. The day we arrived we wanted to head to the Hot Springs, however, it was insanely pouring. We thought about going after Machu Picchu, but honestly we were so exhausted we just wanted to sit in a restaurant and do nothing. 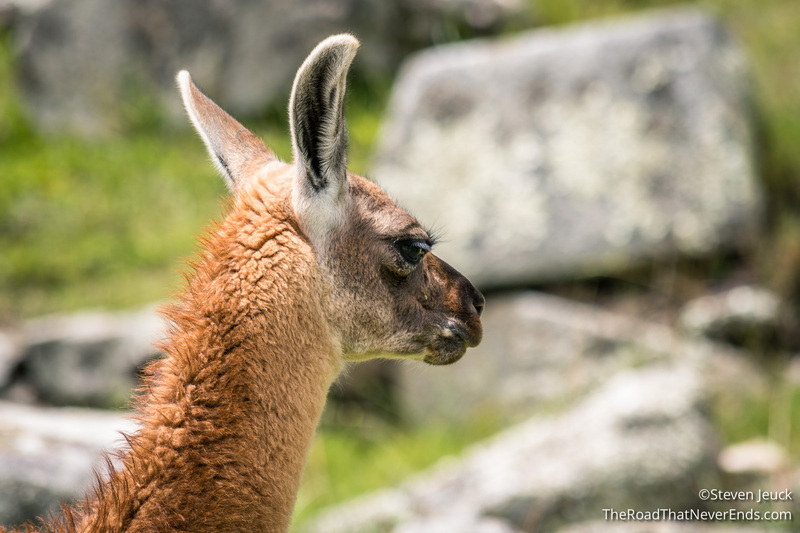 Machu Picchu – Arriving in Machu Picchu, we didn’t really know what to expect. We had read that umbrellas were not allowed in the park, as well as food. We decided to try and sneak our lunch in with snacks, and it paid off. However, the gentlemen ahead of us in line had their bag checked, and had to check their food at the counter. I am not sure why I and several other people didn’t get checked, and some people did. It seems to be quite random (Note from Steve: “Just like most of South America”). Throughout the day, we saw several people with umbrellas, so maybe they just don’t enforce certain rules. Steve and I decided to have our hotel pack our lunch for S/15, rather than buy at the café, which we read was overpriced. We also had brought in some snacks to enjoy during our long hike. The reason that don’t want you to bring in outside food is to avoid trash on the ground. I have to say, I was pretty amazed at how clean the ruins are. Steve and I did our part and kept it clean, taking all trash out with us. We had also saw that the hotel on site offers a lunch buffet for $39 USD, way out of our price range. The first stop we went to was the Guard House, to get that classic Machu Picchu picture. Short on time before we made our way over to Huayna Picchu for our 7am-8am time slot. We got there at 7:55am, checked in, wrote our name and time, and began our hike shortly after. The hike was a Stairmaster extreme! In some areas the steps were big and wide (challenging for a short person like me) and other places it was short and small, where Steve had to walk sideways to get an entire foot on the step. During the week prior to this, we had done three 10mile + hikes, so I felt confident I could do it. This was a challenging hike, that involved heavy breathing, curse words, and praying to God on my part. Steve took it all in stride and just pushed me along the way. The altitude made me nauseas and my chest hurt the entire time, but we made it to the top. It is a cliché, but the hike is worth it. You celebrate with other hikers, cheer more on making their way up, the views are spectacular, and you gleam with pride. We stayed on top for about an hour, enjoyed a snack and the views, and finally began the decent down. Now going up is hard on the heart, but going down is hard on the knees and hips. Ouch, my body felt it. When we made it to the bottom, we decided to sit for about 20 minutes, relaxed and people watched. We then made our rounds to other areas of the ruins and spent a few hours exploring before settling down and eating lunch. We ended up getting caught in a light shower, and had to eat our lunch huddled under a tree. After lunch, we went back in to the ruins, and finished seeing all of the sights before heading back to town on the bus. From Aguas Calientes, we took PerúRail back to Cusco, a $94.00 ticket. We met such a lovely couple on the train ride – Santiago & Mariana – hope the rest of your trip was amazing! On the train, we enjoyed Inca corn and Chicha Morada – I am going to miss that stuff! Steve and I talked about this in quite detail on our bus ride home. 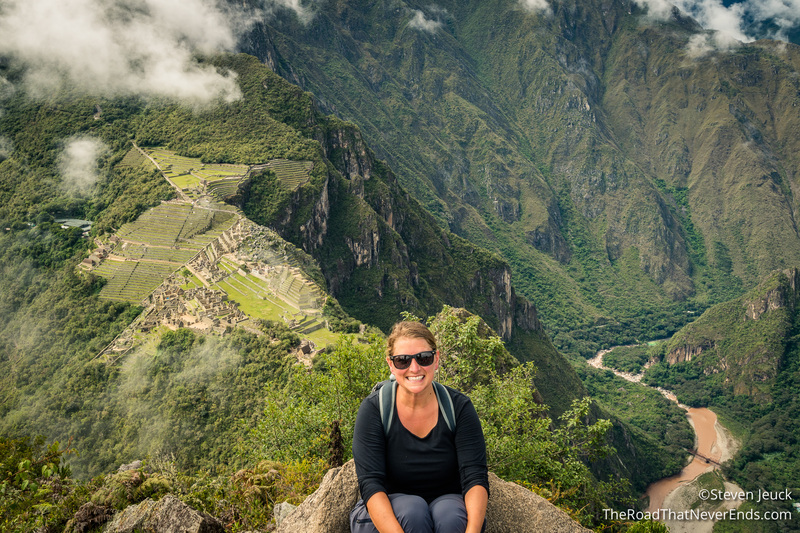 If money was not an issue, we would’ve loved to do attempt the Inca trail hike. Also, we would’ve bought tickets than included the museum. We also are really happy that we arrived at 7AM. By 10AM the place is packed and hard to maneuver around. The crowd dies down around 2PM, but by then we were exhausted and ready to head back into Aquas Calientes. I should note, the bathroom is outside the ruins. So if you need to go, you will need to exit the ruins and re-enter. You are only allowed to re-enter 3 times total. Also, the bathroom does cost S/1.